Express your personal style on a conservative job interview. There's no more basic go-to interview outfit than the old pencil skirt, blazer, and button-up blouse combo. It's classic. It's easy. And it's always appropriate. It's also kind of a snooze. But that's OK! Sometimes that's what's called for. Hey, you can't interview at an accounting firm in the same thing you would wear to interview at, say, the Cosmopolitan Philippines HQ (where short dresses and crop tops are considered completely acceptable office attire). But just because you are interviewing in a more conservative environment doesn't mean you can't express your personal style. You just need to make sure you're doing it in a way that doesn't distract from the content of your résumé or the quality of your interview. Have fun with your basic interview look with these 10 tricks. 1. Add a chic waist belt. The belt should fit snugly on the middle hole without bunching your clothes underneath. If the tail is long enough that it does not lie flush with the rest of the belt, you may want to use a little double-sided tape to hold it down. And avoid anything too wide—always less than three inches and really less than two if you are petite or have a particularly large bust; otherwise it can start to look like a cummerbund. 2. 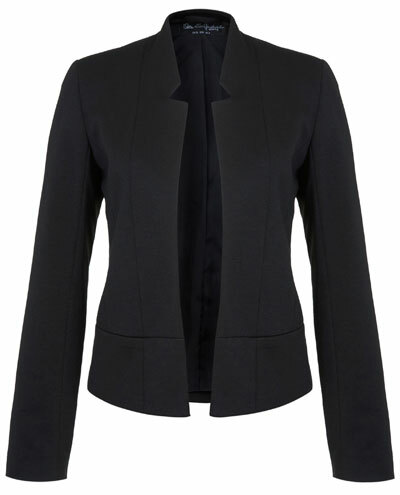 Wear a sleek collarless blazer instead of a traditional one. Nothing says serious interview outfit like a good blazer, but blazers without lapels feel a little more fashion-forward and if you have a large chest, they often look more flattering too. 3. Add a badass pair of sunglasses. You're not going to be wearing them in the actual interview, but sunglasses make any outfit feel instantly cooler and just wearing them to the interview will change the way you feel about your outfit. 4. Wear gorgeous, matching lingerie. If you love lingerie, then by all means wear some amazing lingerie to your interview. No one you meet with is going to see it—it will be completely hidden under your clothes— but you'll know it's there and you'll feel more confident as a result. 5. Wear the standard interview clothes, but in a different proportion. Instead of a knee-length pencil skirt, try a midi. Instead of a standard blazer, go for something slightly cropped or a little longer. Just make sure you are appropriately covered up and that everything is clean and fitted impeccably. 6. Get a cap-toe shoe. Instead of a basic pump or pointy-toed flat, try one with a neat little capped toe in a contrasting color. It's a subtle way to add a little colorblocking to your outfit without turning your shoes into a distraction. A good interview bag should have simple, clean lines and be large enough to hold your résumé without wrinkling or creasing it, but you can add a little personality to that simple bag by tying a small silk scarf around the handle or even using it to wrap one or both handles entirely. Cotton and silk are pretty standard, but they're so flat that they can start to feel a little boring, especially when you're trying to stick to neutral colors like white, black, gray and khaki. Try mixing in some tweed or lace or even a little leather (provided it has a matte finish). As long as the colors and shapes are still conservative, no one should raise an eyebrow. 9. Instead of a blouse, wear a fancy, fitted T-shirt. Look for T-shirts that hug your body and can be tucked in without a lot of bunching, and stay away from anything with a ribbed neckline, since those can easily start to look like undershirts or weekend-wear.